I have just participated in my first Critical Mass Ride. The rides start from the Racecourse Pavilion on the last Friday of each month, leaving at 6.00 p.m. The route sometimes changes and takes an hour to complete. This month’s ride was rumoured to have a picnic included but the rain put the dampers on that idea. The mass of cyclists started to assemble after 5.30 p.m. We started off at six o’clock, led by Chris on a Ministry of Bikes bicycle. The route took us along Kettering Road and Collingwood Road; then past some rowdy cricket fans going to the County Cricket Ground; on to Abington Park and into town on Wellingborough Road. 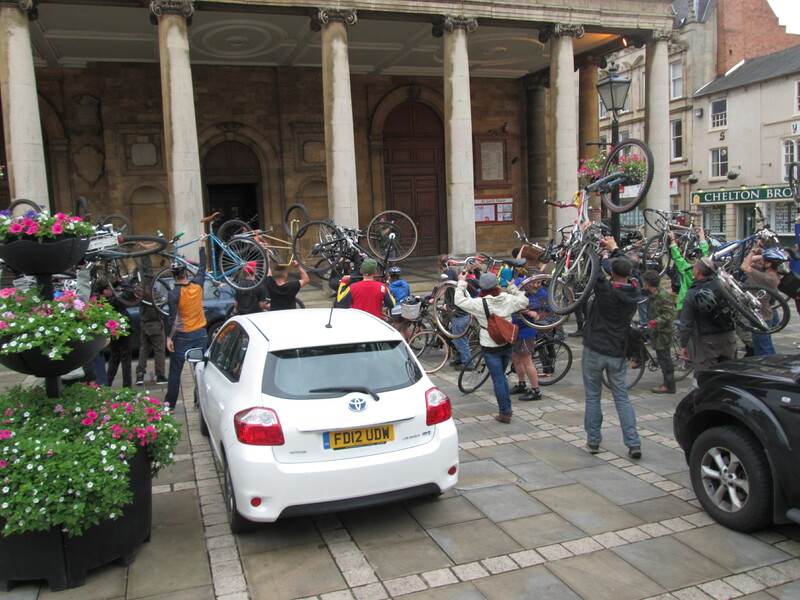 We stopped at All Saints Church to lift our bikes up in the air in Celebration? or Protest! 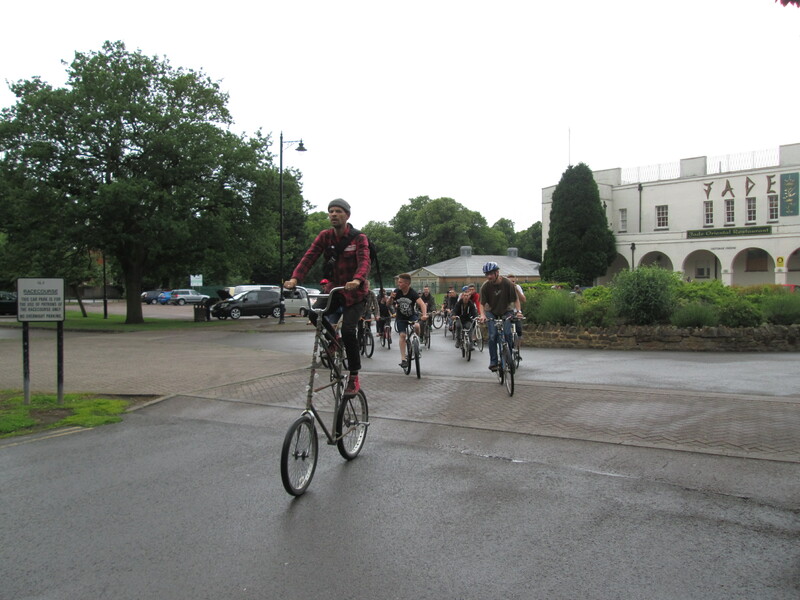 We then cycled back on Billing Road, Wellingborough Road, around the Charles Bradlaugh Statue and up Kettering Road to the Pavilion. 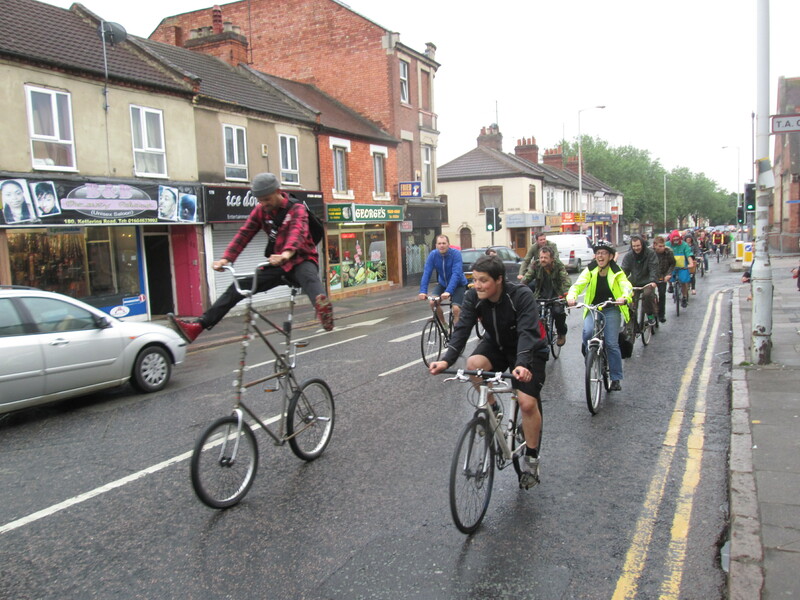 Next Saturday (6th June) is a chance for a ride with a difference. There is no CTC Northampton ride but there is an Audax ride out of Oundle. Never tried one before? An own-pace-with-directions tour of the lanes to the north and north-east of Oundle with distance options of 60, 90 or 120 miles (well actually their metric equivalents) and, usually, plenty of choice for company. 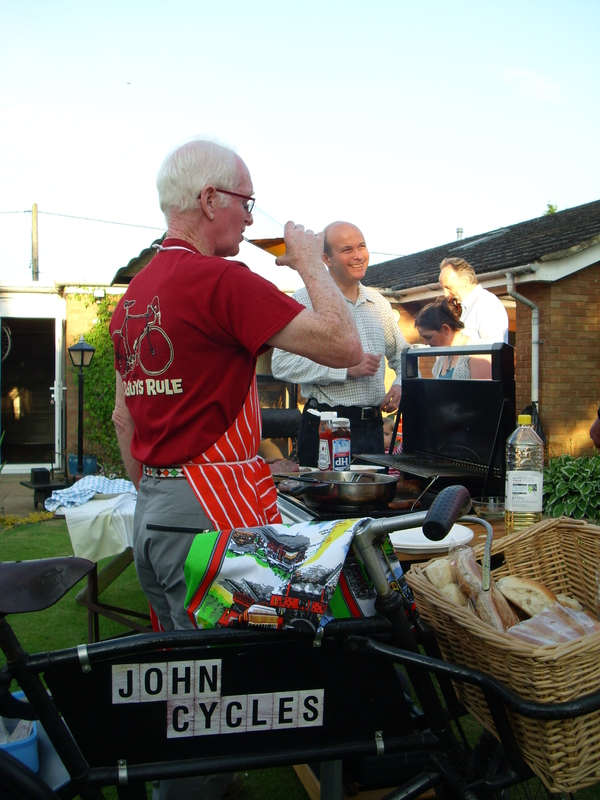 At John D’s in Nether Heyford, a friendly gathering of riders from Milton Keynes, Northampton and the surrounding surrounding area was blessed with nice sunny weather. There were around two dozen of us feasting on sausages, burgers and salad,followed by desert and coffee. Beer was available from the barrel and the ride home in the dark with Brian and Ian made a change to daytime riding. The route of our ride out and back – 22 miles – is here. For various reasons, not least of which may have been the damp and dismal weather forecast, only three of us turned out for Sunday’s Stowe Park Loop ride. This was disappointing but we are nearing peak season for other cycle-related activities so perhaps it’s not too surprising that turnout was low. Brian, David and I enjoyed ourselves though. Heading out into the wind, we worked our way down through Stoke Bruerne, past the southern tip of Towcester and onto the lanes that lie between Paulerspury and Milton Keynes, passing a familiar Sustrans face heading the other way, before Brian navigated us down into Buckingham while managing to avoid traffic completely. Looking for coffee in Buckingham, we wandered into a courtyard arrangement, similar to where we go in Olney, which held not just a brasserie/bistro but also a bike shop. The shop staff made it clear that there are only two decent places in which to get coffee in Buckingham, and there was nowhere to park bikes within sight of one of them. That left the bistro in the courtyard as the other (and our preferred) choice. Highly recommended, especially for Canadian-style pancakes. A couple of mini-roundabouts and a short climb saw us out of Buckingham and on the straight, and very grand, approach to Stowe Park but rather than head into the grounds we skirted round them for a short stretch before turning off towards Biddlesdon and thence to Syresham, which appeared to have been taken over by scarecrows for the weekend. From there, the plan was to head up through Helmdon to Sulgarve Manor for lunch but this was a little scuppered when we discovered that the road to Helmdon was closed. After a quick review of the map, it was determined that we could simply do the other two sides of the square so we were stuck on the main road a little longer than had been anticipated, but when we finally turned off it: Tailwind! Sulgrave was also busy, it being open garden weekend. (And also open-your-car-door-without-looking weekend! Don’t ride too close to parked cars). Lunch was, I have to say, a disappointment. We’ve been to Sulgrave over and over again and it’s always been fairly reasonable but not so on this trip. I don’t know why it’s changed but changed it has and much for the worse. Thank heavens for coffee-stop pancakes. Brian had cunningly contrived to make the home leg of the route tailwind-assisted all the way so we made excellent time back to Northampton, Greens Norton’s signpost deficit notwithstanding. Sadly, it wasn’t quite an excellent enough time to prevent us from getting drenched on the A45 cycle path. It seems that the weather had got fed up with us ducking under trees for a couple of minutes when it threw a light shower down and decided to throw everything it had at us when there was no shelter around. It was going alright up until then. Thanks to Brian for a different and interesting route. The full details are to be found here, with a bit extra (although don’t believe all you read there. It appears to show us getting lost, exceeding 100 mph and climbing a mere 2000 feet)! 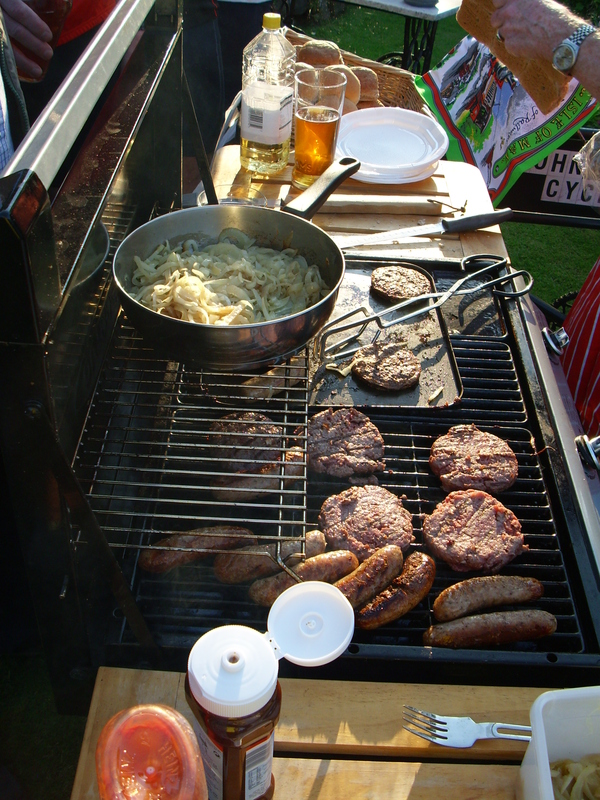 CTC NMK’s (Northamptonshire and Milton Keynes) annual BBQ is happening on Wednesday 26th June – 7.30 p.m. – at Watery Lane, Nether Heyford. The Northampton section will be joined by Milton Keynes and Kettering sections for a friendly social gathering. Entry is by ticket only so now that summer’s here (honest!) treat yourselves to a social evening, with food, and contact John Dunkley (01327 342588) now to get hold of your tickets. Prices are very reasonable at £7.50 per member and the same per guest and profits from the evening get returned into our funds so it’s all in a good cause. Don’t worry about the weather. John has plenty of gazebos and tents if it is wet. (I’ve checked the forecast and it’s scheduled to be a warm and dry evening.) 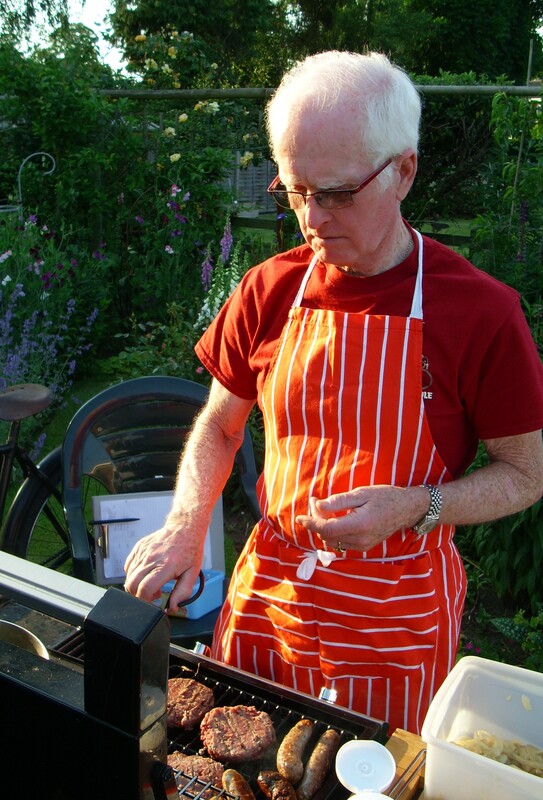 The BBQ includes the usual meats and salads including veggie options plus not-to-be-missed delicious sweets. Please contact secretary@ctc-northampton.org.uk if you would like to join a group cycling there from Northampton. Start 6.30 p.m. (about 10 miles, leisurely pace, lights needed). Leisure Ride Upton Mill lakes. As part of Summer of Cycling in Northampton the CTC section cycling group are leading a ride on cycle paths from Beckets Park alongside the River Nene to Upton Park Lakes and returning through Upton Park. There is a short stretch where the route is on a firm gravel Bridleway otherwise it is on tarmac. Main roads are crossed where there are pedestrian lights. This is a flat ride; the only inclines are the bridges over the river and canal.! 10.30 am Start Midsummer Meadow Car Park next to Beckets Park (parking charge). NN1 5PE. along Bedford Road. Alternatively park free near (but not in) the Canoe Centre under the A45 flyover and use the cycle path along the Bedford road to Beckets Park, about ¾ mile. The ride will take about 2 hours at a leisurely pace. Please bring a bottle of water. You do not need to be a member of the CTC to take part in this ride. If you would like more details of the ride please ring me on 01604 622073. Please pass this email onto your friend or relatives who may be interested in the ride. CTC-Northampton club ride Summer of Cycling in Northampton. This ride is registered with the Summer of Cycling and non CTC members may ride! Distance 53 miles, club ride Cat B but at the more leisurely end. We plan to return by 3.30pm. Route: Blisworth, Stoke Bruerne, Paulespury, Lechhamstead, Buckingham (coffee), Stowe Park, Syresham, Helmdon, Sulgrave Manor (lunch), Wappenham, Greens Norton, Tiffield, Northampton. Please bring water and a snack. Sulgrave Manor serves sandwiches, soups and similar.